Alas, the Sierra have come to an end. I enjoyed the totality of them so very much. The second half of the Sierra was not quite as daunting as the first half, but it still posed it's challenges. More than anything though, I continued to gawk at the beauty of the landscape surrounding us. Less snow, more forest, more meadows and, unfortunately, more bugs. The advent of mosquitos on the trail sucked, but we tried to not let it ruin the beauty that surrounded us. The lush meadows and increase in greenery keeps you grinning all day. It's all quite humbling really. People have not infrequently asked me what I miss about the "real world." When you exclude people from that answer, it gets hard. I obviously miss friends and family, but things not so much. We adapt to our surroundings incredibly well, and I rarely found myself yearning for some material possession. Even food wasn't a big deal. Sure, it would be nice to have a fancy meal, but we cook hot meals and manage to get along just fine with the food we have. Then, in one resounding moment of resolution, I had my answer. 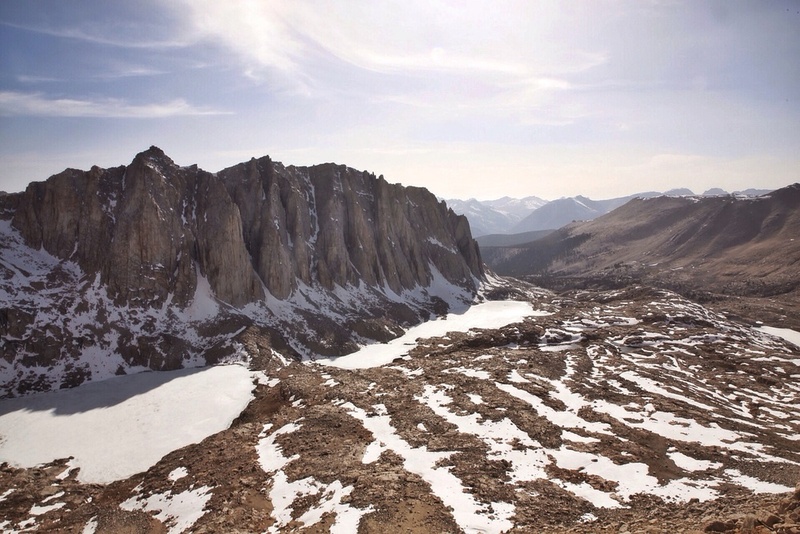 We had heard tale of a home-cooked meal at the Muir Trail Ranch, a mere 2 miles off trail, but were crushed when we arrived to find a locked gate and a closed sign. By that point we all felt defeated and needed food, regardless of its quality. While sitting around outside the gate eating ramen an adorable dog came through the fence to hang out. That dog lifted my spirits as much or more than any burger could. It nuzzled us and wandered around doing dog stuff. Its curious, friendly nature makes me instantly smile. Animal companionship is such a beautiful thing. I occasionally think of myself as a competent photographer. While landscapes and haven't always been my thing, it's hard to walk through these scenes and not try to capture or document them. I thought it had been going OK, but when we got to the high Sierra, something happened. I found myself wholly incapable of capturing the world around me in any decent sense. This is not to say that I'm rehearsing a sense of self-deprecation on a blog, but rather to say that the scenery here is so amazingly grand I'm at a loss. The photos that had previously looked as if they accurately and somewhat eloquently represented the views I encountered now appeared dull when compared to what lie before me. The world that exists here is like none I've ever experienced. Not even close. In a word, it is rewarding. The nights are bitter cold and the sun beats down in the day. The altitude makes your lungs burn and your heart pound. But everywhere you look there are towering mountains, endless streams, waterfalls, lakes, valleys and forests. Each element is so immersive, so extraordinary. The Sierra really makes you work for it, but holy crap is the payoff sweet. I hope this gives you an inkling of the feeling it gives me to be in its presence. The desert has come to an end. As we hiked our way up into the Sierra Nevada our jaws dropped at the beauty we saw around us. We haven't managed to pick our jaws back up yet. 60 miles later we found ourselves at the trail juncture that would lead us up to the top of the tallest peak in the lower 48 states, Mt. Whitney. At 14,505 feet, it's a doozy. 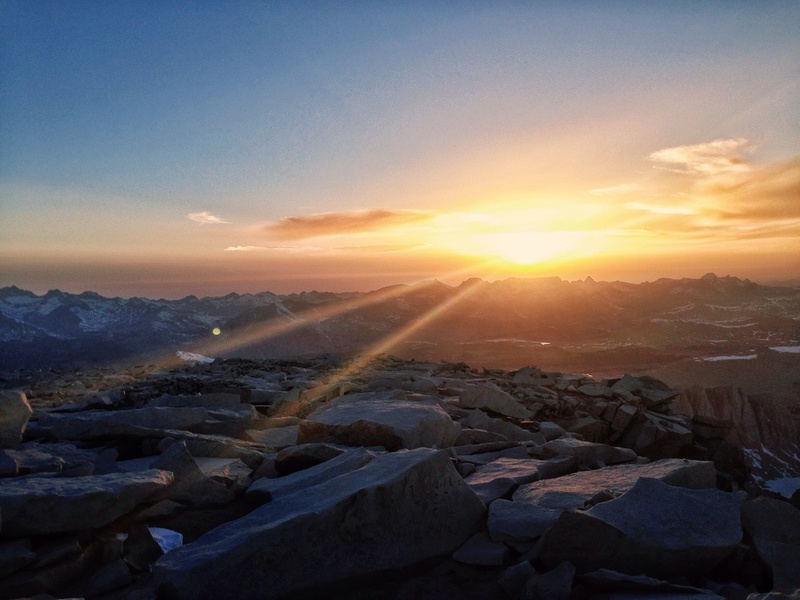 There are an endless number of ways to "do Whitney," and we thought it would be cool to ascend in the afternoon to see the sunset, sleep in the Smithsonian shelter at the summit overnight, watch the sunrise and then descend that morning. Sleep didn't come too easily, but what do you expect at 14,000 feet sleeping head to toe in a small hut? No worries though, we kind of expected that. It was worth it. The morning was bitter cold and windy, but nothing could dampen our spirits as the sun began to rise over the eastern Sierra. Then our friends started showing up. One by one, Bomber, Siesta, Butters, Cheese, Midway, Barbie, Freedom, Friendrik, Washpot and Baggins reached the summit, each of them having started in the wee hours of the morning. We all crammed ourselves back into the hut to celebrate the reunion. Soon enough, however, it was time for us to head back down the mountain. The views were awe inspiring, completely breathtaking. Or was that the lack of oxygen that was breathtaking? Who knows. It was astounding. But enough of my jibber jabber. Why don't I show you. Half'n'Half pushes through the struggle of breathing at high altitude. Soap Box being epic most of the way up. The teeth near the summit. Obligatory group photo on the summit. What strange things are amok outside the shelter? I think it best to stay warm in the hut. Soap Box, Half'n'Half and Pedi (me) bundled in our bags at dawn. Also known as common turricula, this plant has altered our trek from Mexico to Canada. It thrives in areas affected by wildfires - where tree cover has been removed (burned). We're hiking in SoCal. Thus, drought and lots of burned areas. Ergo, tons of PDB. Easy to identify and reeking like pot (or certain thru-hikers), you know when it's near. It's like the poison oak of the San Gabriel mountains, except more dangerous. PDB has grown so thick along the PCT that there are detours to avoid sections overrun by the plant. It's kind of pretty, but I'll be happy to never see it again. "DUDE, this place is beautiful." Most of the way up San Jacinto. Soap Box, Pedi, Half and Half, and Quinoa at 10,800 ft atop Mt. San Jacinto. We climbed over many a fallen tree at higher altitudes. Jonathan hiking through the fresh snow. Jonathan descending, seeking warmer climbs. Half and Half snapping photos at the summit of San Jacinto. We say our goodbyes to the snow covered mountain (Not unhappily).